Your endothelial cells cover the surfaces of your blood vessels and play an important role in their health. They help form nitric oxide, promote vasodilatation, inhibit platelet activation, and keep your vessels functioning properly. But in people with cardiovascular disease related to type-1 or type-2 diabetes, the endothelial cells don't always function properly. Fortunately, according to new research, there may be something you can do to help. 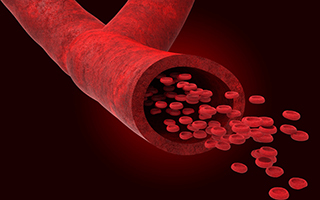 When endothelial dysfunction occurs, vasorelaxation is often blunted, and macro- and micro-vascular complications can occur. Less nitric oxide can reach the cells, and oxidative stress typically increases. However, research has found that polyphenols can help slow and reduce endothelial dysfunction. Polyphenols have powerful antioxidant properties. So they help reduce the dysfunction in part by preventing oxidative stress to the arterial walls. The researchers also believe that polyphenols may benefit endothelial function by reducing the effects of excessive blood glucose levels. In diabetics, this could mean that polyphenols can help reduce the risk of both macro- and micro-vascular complications. Whether you're diabetic or not, try eating a wide variety of polyphenols. Not only do they have great antioxidant properties, they have been shown to be a natural anti-inflammatory with significant health benefits. You'll find them in fruits, vegetables, nuts, red wine, olive oil, and one of my personal favorites, green tea. More recent research is demonstrating that polyphenols are a strategic nutritional addition to an optimally healthy diet, such as the Mediterranean diet. Sometimes it's difficult to get enough fresh vegetables and fruits consistently into our diet. As for me, I eat a very healthy diet. But during the last four months, I've been using Advanced Bionutritionals Advanced Polyphenol Formula. To my surprise, I've noticed that I feel a "boost." There's no research at this time showing that sufficient dietary polyphenol will improve our energy, but that has been my experience. Advanced Polyphenol Formula is full of concentrated, plant-based polyphenols that are of the highest quality. They can give you a great boost in your quest to reduce inflammation and increase circulation throughout your body.